Hello, welcome to my new site and design. I am now using the blog tool and publishing platform, WordPress. This tool should allow me to easily update and maintain the site through future updates and revisions. And allow me to communicate about web development, projects, and business from this platform. I even attended a local WordPress Camp Austin in support of this great tool! The year is 2010. Change is upon us. Much needed change, so this site is changing, too. Where comments are open, please provide feedback. I will try improve this site and space and make frequent, although don’t be surprised if they are less frequent updates. This page is meant to be somewhat of a blog, but I have other sites that I maintain for my own businesses, so this space may get neglected. Also, I only plan to include business appropriate material here. Please find me below on social media networks to learn more about me, connect with me or contact me. I live life, love, & work deep in the heart of Texas, in the hill country capital of Austin; along with my wife, Jenny, my son Garrett, and my daughter Grace. We enjoy spending as much time together as possible. Mostly outdoor activities, so if you don’t see me around on the internet, then this is why, wish me luck. 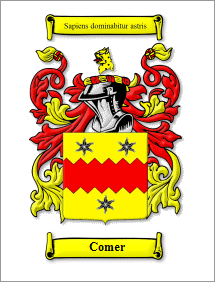 Learn more about us on our Shutterfly blog, The Comer Family. Jenny is a photographer and owns Pretty Paper Photography, please contact her for your family portraits. Matthew Comer D.B.A. is my own freelancing, consulting, contracting work for web development, web design, and website maintenance. You are here! syphonsoft is a web hosting company that I started over 8 years ago. syphonsoft merged with Peoples Information in 2004 and has steadily grown ever since . We have many diverse clients and host a variety of websites and businesses. Freeman Properties is a small real estate and leasing business that my wife and I own. It consists of houses in Austin, TX that we lease. This site too recently got a makeover. A property just became available for lease on 4408 Hank Avenue for lease April 1. Lawn-Mat – Lawn Care Services was a lawn care company that I formed in 1996 and dissolved in 1998 when merged with Natescape Lawns of Austin. We serviced lawns all of the Austin area and had many clients from residential to commercial properties on weekly schedules. A crew is being assembled for 2.0 in the Spring/Summer of 2011! Such Good Photography is my photography business. I will shoot any type of pictures that I find pleasing or any photos that anybody would like to contract my services out for. I specialize in taking pictures of bands, live onstage, performing music! A rock and roll photographer! I have photographed many musicians, artist, celebrities. I have worked as a photographer for SXSW shooting movie premiers, showcases, and special events during the conference. Some of notable photographs that I have taken are of Courtney Love of Hole, Jacob Dylan of The Wallflowers, HR of Bad Brains, Cheap Trick, Citizen Cope, Cracker, Metallica, and The Gallows. Redleaf Brewing is start up brewing company that I and two other beer lovers and fellow brewers started in 2007. We brew small batches of handcrafted home brew style beer. We strive to create the highest quality beer with a flare for the unusual and unique, yet keeping with the spirit of a small brewery, catering to the tastes of beer lovers abroad. We are currently on a hiatus, but keep an an empty glass out for us, if you want to try some of this fresh and tasty beer. Fat & Tappy and Wagon Road West Distillery are other related sprouting businesses. The 2010 SXSW Music Festival starts in less than two weeks. I volunteer as a photographer for the event. Photos from this year’s events to be posted soon. Here is my SXSW schedule for this year. In April, there is the Old Settler’s Music Festival where I have volunteered for the past few years on the Watering Hole Crew and now Runner. Also, it is the time of the Delta Tau Delta – Zeta Delta Alumni Reunion in San Marcos. I pledged Delt in the Fall of 1993 and initiated the following year. I held the positions of Recording Secretary and Vice President. I was also the Interfraternity Council Representative and Interfraternity Council Judicial Board Member. I became a an Entered Apprentice Mason at the Lockhart Masonic Lodge #690 A.F. & A.M. lodge in 1997, then continued training at the Onion Creek Masonic Lodge #220 A.F. & A.M. I am working on completing my degree this year. I volunteer to help where I can and where my skills can help. I have also volunteered with Philip H. Anselmo’s Housecore Horror Film Festival (HHFF). It was a great experience as I was able to lead and manage groups of other volunteers that were dedicated to make this inaugural event a huge success. Just in time for Halloween, for both music and film enthusiast alike, it was a perfect melding of the two. Surely, this will become an annual and or future touring event. Involved in other films and film making, worked on two short films for Writer, Director and Filmmaker, Stan Von Miller. I am a member of the Austin Film Society where I enjoy many benefits of seeing film premieres, special events, screenings, and parties. I have been a member since 2004 and continue to support this great non-profit organization. In June, there is the Hays County Ducks Unlimited Banquet & Auction in which I have been a Committee Member for the past few years and now the Treasurer. I have been attending the Banquet since the beginning of this chapter. As well as attending DU Banquets in San Marcos while at Southwest Texas State University (SWT). I am also an avid BBQ enthusiast and cook. It is very hard to locate Pink Butcher Paper that the best competition smokers and Pitmasters use, so when I found it, I started selling it at Texas Butcher Paper to spread the love of BBQ so all could enjoy. There are many different organizations and associations that I am involved with and where I can display my leadership and skills. Also, there is the Pink Santa charity organization that I have been involved with going on 10 years this December, look for more to come here. Our family regularly attends the Oak Hill United Methodist Church. We have not become members yet, but have been visiting for some time and regularly volunteering to help in anyway that we can, be it on Chicken Day Dinner, to both Jenny and I with Sunday School. My wife and I donate blood regularly at The Blood Center of Central Texas to keep the community vampires happy. And sometime stock trader, formerly of the good ‘ole days of day trading. Now using ‘tips’ on thelion.com. I formerly participated in an Adopt-A-School program and looking to becoming a Big Brother. As well as Adopt-a-Highway program with a stretch of road outside of San Marcos. Also, I am very political, although I no longer vote. Tomorrow is the last day to vote in the Texas primary. Debora Medina is a good choice for Republican Governor, although anybody would be better than current Governor Rick Perry. What we need is real change. 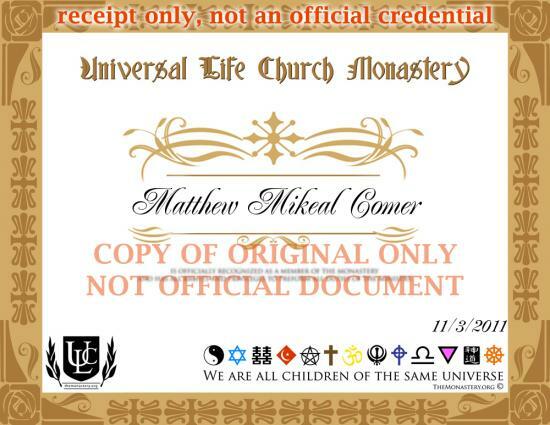 Oh, and I was watching Conan O’Brien and ended up becoming an ordained minister online at Universal Life Church Monastery Ordination. So here we are back to change. Change comes full circle. Just be good to the ones you love and good to the ones you don’t. And we will all be good. This entry was posted in Matthew Comer and tagged fat and tappy, freeman properties, lawn-mat lawn care services, linkedin, matthew comer, pink santa, pretty paper photography, redleaf brewing, such good photography, syphonsoft, texas butcher paper, wagon road west distillery. Bookmark the permalink.